School buses are common sites in our communities and local roads. They carry precious un-replaceable cargo and our futures. Children traveling to and from school safely is everyone’s responsibility. When we see a school bus on our local roads, citizens need to check their driving habits, and understand that our school buses make frequent stops to pick-up and drop off students to school. 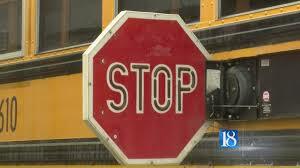 When a school bus turns on the stop warning signs and activities the stop arm this alerts drivers that the bus is stopping; however, many vehicles disobey the school bus stop signals and violate the law by failing to stop. Failing to stop places our children in danger of being struck by an inpatient driver who disregard’s state laws so they are not inconvenienced. Bus drivers and law enforcement officers are indicating that school bus passing violations are on the rise. Children are at risk and this is unacceptable. One company is taking action to make our children’s bus rides to school safer. American Traffic Solutions in Tempe, AZ has developed the CrossingGuard® School Bus Stop Arm Enforcement System. 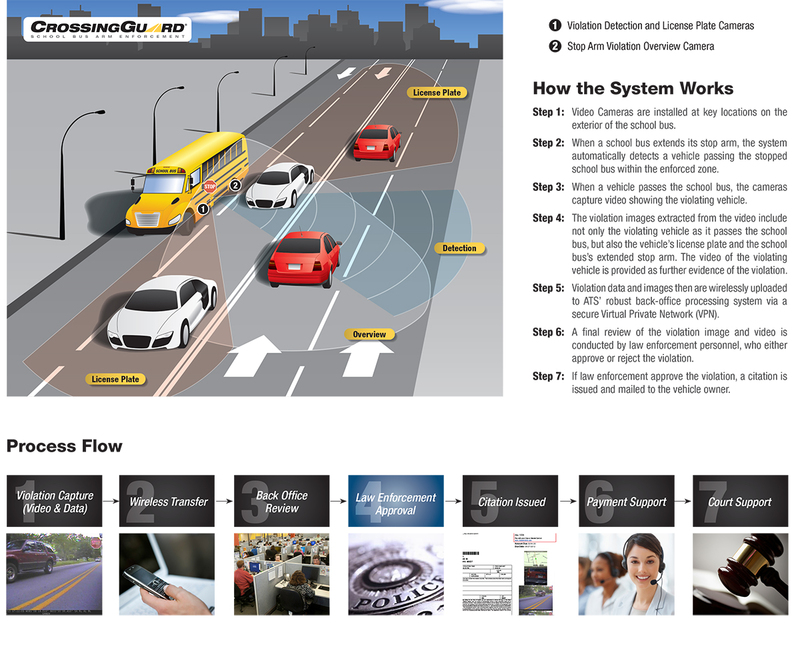 “The CrossingGuard® system is completely automated enforcement system that requires no bus driver involvement. 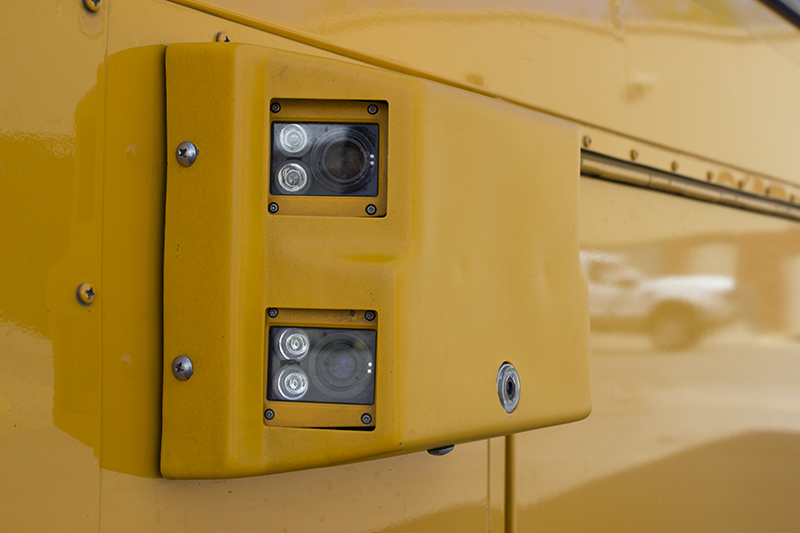 High-resolution cameras installed on the exterior of the bus automatically capture images and video of violating vehicles as they illegally pass the stop arm. In addition to capturing video, the system automatically embeds a data bar which includes GPS coordinates, date and time of the violation, and other relevant violation information used to create a comprehensive evidence package. Once the system captures the full violation package, it automatically sends the violation data to ATS’ remote back office via a secure private cellular network for review and processing. A final review of the violation image and video is conducted by law enforcement personnel, who then may approve or reject the violation. If the violation is approved, a citation is issued and mailed to the vehicle owner. Payment collection and court support are also included as part of the programs complete end-to-end solution” (CrossingGuard®, 2016). Helping our children stay safe is every citizen’s responsibility. There is no excuse for being so impatient and in such a hurry you are willing to risk the health and safety of children. Adding texting while driving in the neighborhood and this is disaster in the making when school buses are present. Our states, cities, and counties have adopted traffic laws to help make driving on our busy highways safer. Driving is a privilege and not a right. Are you driving and setting an example for others? Posted in Mark's Articles and tagged Child Safety, CrossingGuard®, Driving Safely, Illegal School Bus Passing, Law Enforcement Technology. Bookmark the permalink.